Hi again! Top o’ St. Patrick’s Day Weekend to you! While many are celebrating their “Irish Luck” at the pub with Guinness, I am at home sipping a very un-festive glass Pinot Noir & absorbing all that I took in at today’s TEDx Encinitas conference (more on that later!). To celebrate this Irish holiday, I have an oldie but goodie to, well, re-share, with you. A few months ago while doing some “mass post tagging,” I accidentally did some “mass post deleting.” Unfortunately, here on Tumblr, once it’s gone, it’s gone. Luckily I was able to retrieve a google cached version if it, & the other recipes I so stupidly wiped & will be able to repost. Below is the original post in all it’s glory! 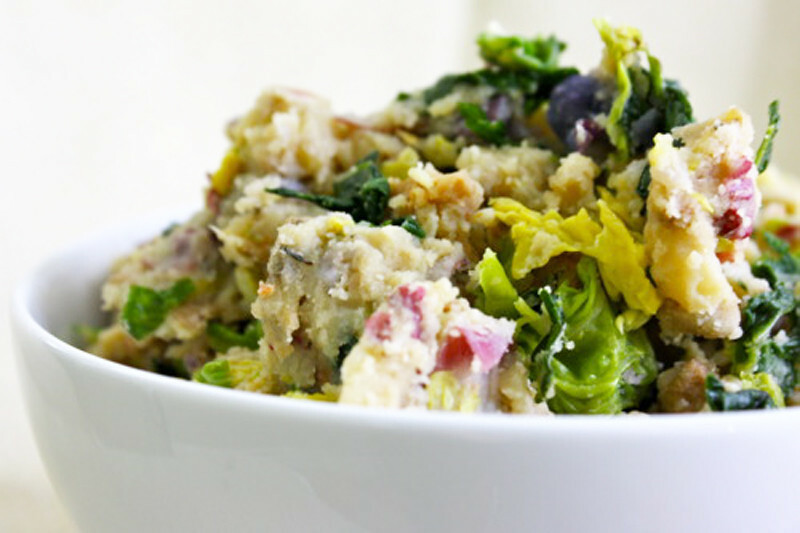 While there are many variations of this rustic dish, colcannon is traditional Irish fare made from mashed potatoes & cabbage, or kale. It is often doctored up with chives, sour cream, butter, leeks, bacon, or ham. I would’ve preferred to use kale as my green, I decided to save the kale for juicing & make use of the savoy cabbage. Instead of the typical russet potato, I used a variety of Yukon gold, red & purple potatoes to add a bit of color & variation to the dish. Besides, I do not have a potato ricer, & russets are a challenge to mash with a fork. To substitute the bacon, I used Torfurky Italian Sausage, as I love the flavor & bursts of sun-dried tomatoes speckled through out. Chop potatoes into 1″ cubes & bring them to a boil in salted water. You can peel your potatoes if you prefer, but I kept the skins on to boost flavor, texture, & nutritional value. Add vegan margarine & garlic to the bottom of a dutch oven. Cook until the margarine is melted and the garlic is fragrant, then add cabbage & toss well to coat. Add sausage & liquid aminos & cook over medium heat until cabbage is cooked down & tender. Once potatoes become fork tender, drain well, then add to the warm cabbage & sausage mixture. Mash with a large fork or potato ricer. 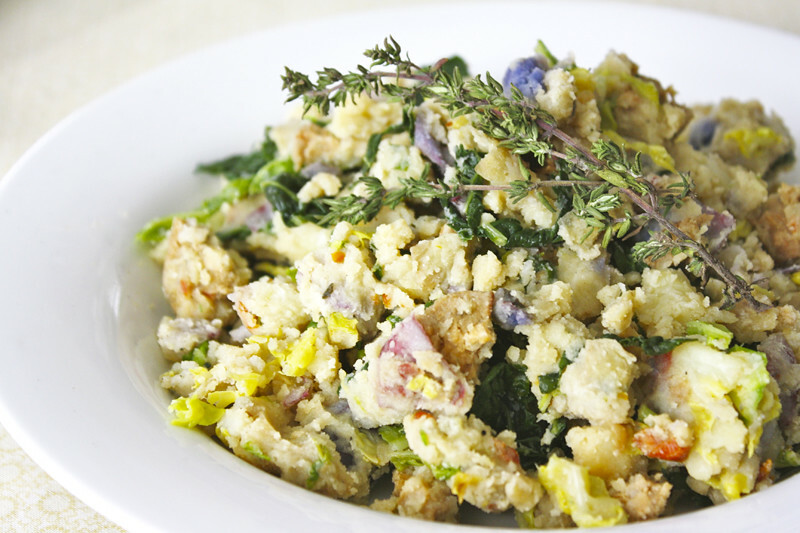 Mix in the nutritional yeast, herbs, & warmed almond milk. Add salt & pepper to taste. Serve immediately. 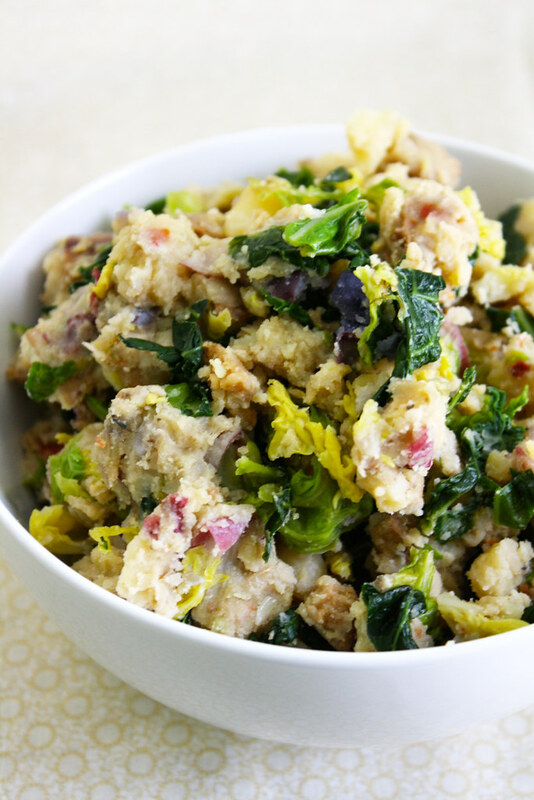 Creamy, buttery potatoes, tender cabbage, zesty vegan sausage make this a delightful & comforting dish to savor on St. Paddy’s Day. As they say in Ireland, ”May your pockets be heavy & your heart be light, may good luck pursue you each morning & night.” Cheers! Oh & sorry for the radio silence around here! Busy as usual, & got a bit off schedule & then my dog broke my computer! I know, I know, sounds a bit like “dog ate my homework” & we all know how well that excuse was received. But really, it was already on the fritz, & then she knocked it off of the couch on to the hardwood floor while it was open & on. Needless to say, it was toast. It took me a week or so to come to terms with the fact (& make room in my budget) that I needed to replace it. I finally brought myself to do it, so happy extravagant birthday to me. I have to say, though, it is amazing & I love it. So stay tuned for more regular scheduled blog-casting, coming soon!